Coming up this weekend is a fund raiser called Music for Mutts which is being organised by the charitable group, Omani Paws. Its on this Friday (26th Jan 2018) from 7pm - midnight at the Dolphin Village. Live entertainment will be provided by the "Bawsher Boys" and there are a number of prizes that can be won. 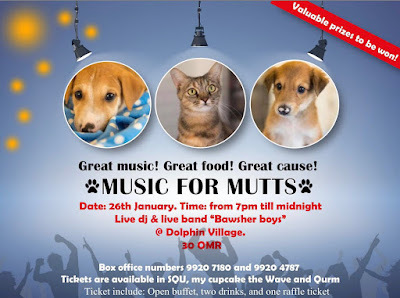 Tickets cost RO 30 and include an open buffet, 2 drinks, 1 raffle ticket and a donation to the on-going costs of Omani Paws and all of the work they do for animals around Muscat. If you'd like to support this excellent cause, you can buy tickets by heading into My Cupcake at al Mouj or Qurum, or by calling 9920 7180 / 9920 4787.